All information about the owner of „Child Neurology”, the Publisher (with the telephone and Internet details), the Editorial and Scientific Board members can be found in the „Editors” on the www.child-neurology.eu website and on the page 2 of each printed issue. 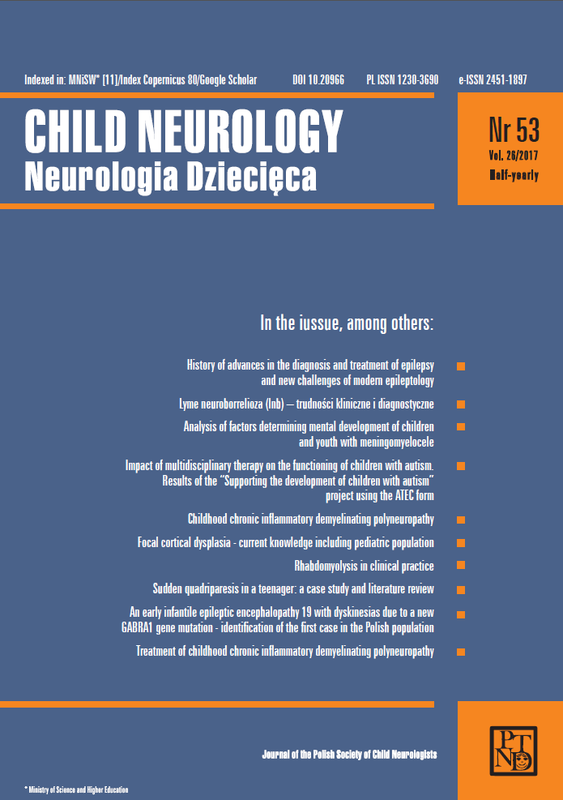 The title “Child Neurology”, which is the property of the Polish Society of Child Neurologists, is defined in its Statute and registered in the National Court Register of the Republic of Poland. It is also uniquely identified by ISSN 1230-3690, e-ISSN 2451-1897 and DOI 10.20966 numbers. In the publishing process the Editor and the Publisher abide by the guidelines of the International Committee of Medical Journal Editor (ICMJE). The Author (s) should get acquainted with the ethical principles and best editorial practice of “Child Neurology” confirming this fact upon the submission of the manuscript. The Editor does not charge any fees for accepting the manuscript, its preparation, reviewing and publication. Manuscripts can be submitted only via the “Editorial Panel” available on the website of the journal. No prior inquiry is required. Manuscript must be prepared in accordance with the “Instructions for Authors” which is available in every printed and online editions. It is believed that the Main Author is authorized to represent the Co-authors. In the event of a change, the Main Author notifies the Editor about this fact at the same time indicating the authorized person. recommendations / references, consents of superiors or institutions are not required to be submitted with a manuscript. However, if they are and the Authors want to present them, the copies should be attached. consent to the free of charge transfer of copyrights to the Polish Society of Child Neurologists. Authors are under an obligation to cooperate with the Editor, in particular in providing explanations, taking into account the corrections, additions, etc. suggested by the Editor and Reviewers. Authors have the right to information about the stages of the editorial work on which their manuscript is. at this stage, the Editor also performs initial assessment of scientific reliability and methodical correctness of the manuscript / research. If any irregularities are found, the Editor-in-Chief asks the Author (s) to delete them, submit relevant explanations, introduce corrections or additions within the prescribed period (maximum 21 days). In the event that the Author (s) fail to comply with the above requirements, the work is rejected. In a situation where the manuscript meets formal requirements but raises significant substantive doubts in the Editor’s opinion, the Editor-in-Chief may apply to a specialist in a given field from among the members of the Scientific Board for an opinion, making the decision on acceptance / rejection of the manuscript dependent on it. After the positive qualification of the manuscript, the Editor appoints two Classified Reviewers who are not in a conflict of interest with the Authors and each other. Reviewers and Authors do not remain in the business nor family relationships. The Editors make all necessary efforts to avoid such situations. a violation of the ethics of publications, bioethical standards or scientific misconduct, the Editor reserves the right to take appropriate actions, including publishing information on the subject on the „Child Neurology” website. As for the Author (s) who are members of the Polish Society of Child Neurologists it is possible to take the actions provided for in its Statute. In the case of research involving humans and animals, the Authors are obliged to obtain the permission of the competent bioethical commission, the informed consent of persons participating in the research and to conduct the research in accordance with the current ethical recommendations of the Declaration of Helsinki and according to bioethical principles in force in the European Union. In research on drugs and medical procedures, drug doses and numerical values must be administered with due care and in accordance with the information published by the manufacturer. The Editor and Publisher make every effort to ensure that the published information is reliable and accurate. However, the Authors are solely responsible for the consequences of providing inaccurate and unreliable information. At the time of publishing the work, proprietary copyrights pass to the owner of the journal, the Polish Society of Child Neurologists. “Child Neurology” provides full and free access to the entire content of individual numbers via the website, including the option of printing on home and office devices. Free access concerns only the so-called permitted information, personal, educational and scientific use specified in the provisions of the Act on Copyright and Related Rights 1994, with amended changes (consolidated text Journal of Laws 2017, item 880). In other cases the consent of the Editor is required, which may be related to individually determined fees. If the Authors include previously published illustrations, the source and the Publisher’s consent should be provided. Electronic editions are archived on servers of the Polish Society of Child Neurologists and the Publisher. Printed editions are kept at the headquarters of the Editor and the Publisher, as well as in the public libraries authorized under the Act on compulsory library copies 1996 with later amendments (consolidated text Journal of Laws 2017, item 961).